For many Latter-day Saints (“Mormons”), serving a Mormon mission as a young adult is a rite of passage, but it is far more than just that. “Mormon “is a nickname sometimes mistakenly used to describe members of The Church of Jesus Christ of Latter-day Saints. Although some people refer to the Church as the Mormon Church, Mormons themselves never use that term, preferring, when a short version is needed, to call it The Church of Jesus Christ so they remember it is His Church. Mormon men can serve missions at eighteen if they have finished high school. Mormon women can begin service at age nineteen. The men serve for two years and the women for eighteen months. 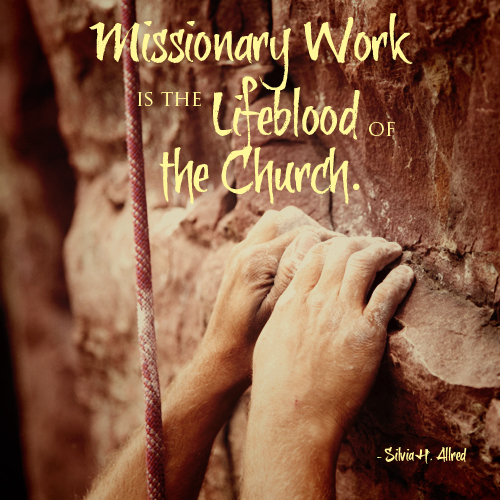 The missionaries serve as volunteers, which means they are not paid for their service. They pay their own way, although Church members often make donations to assist missionaries who cannot afford to serve. It is not mandatory (and the current Mormon prophet, Thomas S. Monson, joined the military instead of serving a mission as a young adult), but it is considered a responsibility for the young men. It is a part of their priesthood duty. Worthy male members of the Church may be ordained to the priesthood, which is the power and authority of God to use under His direction on the earth. Although women are not under the same priesthood responsibility as men to serve a mission, they are welcome to serve and it has long been acknowledged that they are often welcomed into some homes and situations where men are not. When the age of service was recently lowered for them, the numbers of young women serving skyrocketed. Why are Mormon young adults so willing to take a few years away from school, work, and dating to serve missions? This has long baffled people who are not Latter-day Saints, particularly when they hear of the strict rules Mormon missionaries must follow. For the course of their missions, Mormon missionaries do not date, watch secular television or movies, listen to secular music, or engage in most other typical young adult activities. Six days a week they focus on serving the Lord, and on the seventh, they do chores and engage in appropriate recreation, such as playing basketball. And yet, the number of young people eager to serve is increasing. Although young Mormon people hear talk of missions from early childhood, there comes a time when they have to make a personal decision about their service. For many it is a difficult time, particularly if they are already well-known for sports or entertainment. Why Do Mormons Serve Missions? Most who decide to serve a Mormon mission explain that they realized they had the rest of their lives to date, play sports, perform, and go to school. This was a time they could give back to God for everything He has done for them. For many young people, this will be the last time in their lives when they will have little to think about but their religion. During this time, there is extensive dedicated time to study the scriptures and to learn more about what their faith believes. They have a great deal of time to pray, and during their workdays, they are largely teaching the gospel to other people or providing service. It is a time to escape the natural self-centeredness so many young adults experience as they focus only on themselves and their futures. During their missions, God, not their own wishes, is their focus. They receive many leadership opportunities and exposure to the world. Most are sent to places very different from their own homes—wealthy young people to the inner-city, city teens to the country, for instance. Many go to foreign countries and see worlds they’d only read about in textbooks. For some, it is the first exposure to real poverty or a chance to look into the lives of others, as the people they teach often share their life experiences with the missionaries. They learn to live around the clock with another person because they are assigned a partner, or companion. These companions change regularly, from every few weeks to few months, and they must teach themselves to adapt to these changing personalities. It is magnificent preparation for marriage. However, the primary reason most serve is that they love God and want to demonstrate their love for Him by giving Him a few dedicated years of their lives. Missions, then, are an act of love for God and for God’s children. I was taught the gospel by missionaries when I was a teenager. I know first-hand how critical their service is. At a time when many teenagers are pulling away from their families or making dangerous lifestyle choices, the missionaries were gently teaching me to honor and respect my non-Mormon parents and to make moral choices that would protect me throughout my life. They were changing the world—one person at a time.